The 2019 Honda HR-V begins arriving today in dealer showrooms around the country with a starting price of $20,520 (excluding $995 destination and handling)1. For 2019, HR-V expands its appeal with the addition of new Sport and Touring trims, refreshed styling, new technology, and a more refined driving experience, adding to an already established reputation as a versatile and sporty 5-door subcompact SUV. For the first time, HR-V now features the Honda Sensing® suite of advanced safety and driver-assistive technologies – including but not limited to Collision Mitigation Braking System™ (CMBS™), Road Departure Mitigation (RDM) Adaptive Cruise Control (ACC) and Lane Keeping Assist (LKAS) – standard on EX and above trims, making Honda Sensing® available on every model Honda sells. Inside, HR-V benefits from a new Display Audio system featuring a simplified interface that includes a volume knob and the addition of Apple CarPlay™ and Android Auto™ integration. The navigation system, available exclusively in Touring trims, has also been improved with sharper graphics and 3D landmarks. All models feature a redesigned driver's meter with a large analog speedometer and digital tachometer. EX models and above receive a 4.2-inch Thin-Film Transistor (TFT) Driver Information Interface color display offering additional selectable information including available turn-by-turn directions. For 2019, HR-V receives exterior styling updates to further expand its appeal. The grille is enhanced by a new interpretation of the “flying wing” rendered in dark chrome and extending over the new projector-style headlights. Under the chrome band the grille opening has been restyled to emphasize a wide look, and the fog light housings have been enlarged to help give HR-V a more aggressive stance. In the rear, new smoked turn signal lenses are connected by a thin chrome band, lending an upscale air to HR-V's exterior. 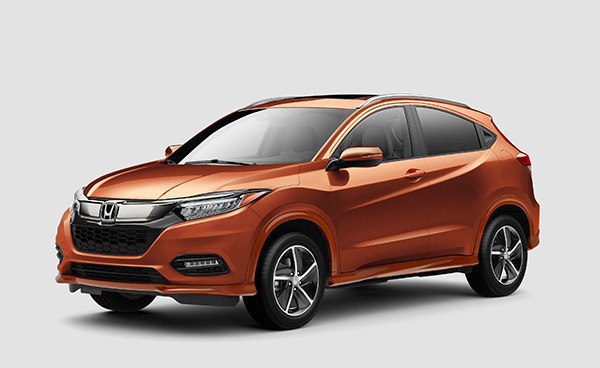 Three new colors have been added to HR-V's palette: Orange Burst Metallic, Midnight Amethyst Metallic, and Platinum White Pearl. Inside, in addition to the new Display Audio system and its easy-to-use interface, the HR-V has an updated interior with new seat fabrics and upper door panels, and a revised cupholder. New for 2019 is the HR-V Sport trim. Fitting between LX and EX, the Sport trim gives HR-V a youthful vibe with unique styling touches. HR-V Sport features unique lower body trim, painted glossy black on the lower front and rear bumper, rocker panels, and wheel arches, as well as the gloss-black exterior mirrors. HR-V Sport also receives a honeycomb pattern grille, exclusive 18-inch alloy wheels and tires, and in the rear there's a chrome exhaust finisher. Inside, Sport trims come with the new Display Audio system with Apple CarPlay™ and Android Auto™ integration, a blackout headliner, contrast stitching on the seats, leather-covered steering wheel and shifter, and sport-style pedals. The new line-topping HR-V Touring trim flanks its honeycomb grille with multi-element Honda LED headlights that are unique in the HR-V lineup, as are the 5-element LED fog lights. Touring models come with exclusive 17-inch machined alloy wheels, for an upscale look. HR-V Touring also comes with similar lower-body trim as Sport, but painted body color rather than gloss black, along with the body-color outside mirrors. Inside, Touring trims get double-stitched perforated leather seats with an 8-way power driver's seat. All 2019 HR-Vs benefit from additional sound deadening measures. Additional sound absorbing materials have been placed in the firewall, under the floor, and in the passenger-side foot well. Sport trims and higher also receive Active Noise Cancellation, which sends reverse-phase audio signals through the HR-V audio system to cancel out low-frequency road noise. Regardless of trim, the 2019 HR-V offers voluminous interior space for passengers and cargo inside an exterior package that's compact and easy to park. Thanks to a revised stay-spring mechanism for the hatch, it's now easier than ever to access HR-V's cargo space of 24.3 cubic feet behind the rear seats (23.2 cubic feet with AWD). 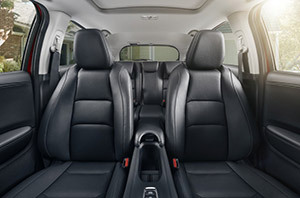 HR-V also uses the multi-position 2nd row Magic Seat®, similar to Fit, which is easily reconfigured for maximum cargo and passenger carrying capacity. HR-V also offers up to 100.1 cubic feet of passenger space with abundant rear seat head and legroom, especially considering HR-V's compact outer dimensions. The 2019 Honda HR-V is powered by a 141 horsepower, 1.8-liter DOHC i-VTEC® 4-cylinder engine. Driving either the front or all four wheels, all HR-V models now use a Continuously Variable automatic Transmission (CVT). The 6-speed manual transmission has been discontinued for the 2019 model year. HR-V's CVT receives numerous upgrades for the 2019 model year to help provide a more natural feeling driving experience. 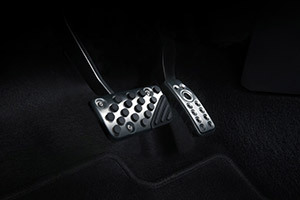 At full throttle, the CVT now features revised shift mapping that, under hard acceleration, more closely resembles the stepped gear changes of a conventional fixed-gear transmission. This “stepped” feel gives HR-V a more familiar feel during acceleration, while also helping to reduce interior noise levels. Additionally, HR-V's CVT uses a more refined and natural feeling engagement, staying at lower revs more often. Other improvements include HR-V shifting to higher revs under deceleration, providing a measure of engine braking force and better responsiveness when the driver returns to the gas pedal. On models so equipped, HR-V's Real Time all-wheel drive system has been improved for better performance in low-traction conditions such as snow. Steering feel in Sport models has also enhanced with the adoption of variable gear ratio electric power steering, which varies steering response in accordance with steering wheel’s position from center. HR-V’s steering becomes more stable at higher speeds as it becomes less sensitive to small movements of the steering wheel. At lower speeds, the steering wheel requires less movement to turn the front wheels, making HR-V feel exceptionally maneuverable in parking lots. For the 2019 model year, HR-V EX and higher trims come standard with the Honda Sensing® suite of safety and driver-assistive systems. Honda Sensing® includes Adaptive Cruise Control (ACC), Collision Mitigation Braking System™ (CMBS™), Lane Keeping Assist System (LKAS) and Road Departure Mitigation (RDM) incorporating Lane Departure Warning (LDW). HR-V’s A-pillars have also been reengineered to achieve a Good score in the Insurance Institute for Highway Safety (IIHS) test for small-offset frontal collisions. Lastly, EX and higher trims receive Honda LaneWatch™ as standard equipment. The 2019 HR-V also benefits from a long list of standard active and passive safety features. This includes Vehicle Stability Assist™ (VSA®) with traction control, driver and passenger front and side airbags, side curtain airbags with rollover sensor, Electronic Brake Distribution (EBD), Brake Assist and Honda’s next-generation Advanced Compatibility Engineering™ (ACE™) body structure. All HR-V models feature a multi-angle rearview camera with guidelines; EX and above get dynamic guidelines that follow the rotation of the steering wheel. The 2019 HR-V incorporates numerous upgrades to its in-vehicle technologies. Headlining the changes is an updated Display Audio system available in Sport and higher trims. 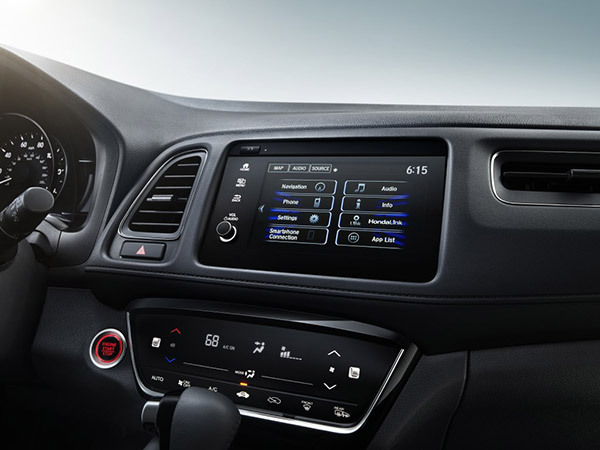 Its 7-inch touchscreen has been reconfigured with new icons for ease of use, and there is now a physical volume knob. Apple CarPlay™ and Android Auto™ integration is now standard on Sport and higher trims as well, while Touring models are available with an upgraded navigation system with higher resolution, 3D landmarks, and an easy-to-use interface. Standard on EX models and higher are walk-away door locks, which automatically lock HR-V’s doors when it detects the key fob is no longer near the vehicle. Sport and higher grades also benefit from Active Noise Cancellation for a quieter cabin, Smart Entry and push-button start, SiriusXM® and HD radio™, fully automatic headlights, and variable intermittent wipers. Touring models use full Honda LED headlights and fog lights, an 8-way power driver’s seat, and HomeLink® remote. The 2019 Honda HR-V lineup offers a variety of trims to choose from, suitable for a wide variety of budgets and buyer tastes from LX to the line-topping Touring. All-wheel drive is available on all HR-V trims. A full breakdown is below. 1 MSRP plus $995 destination charge, excluding tax, license, registration and options. Dealer prices may vary.